This three digit number does more than determine how much a lender will loan you and at what rate. Oftentimes, it is used by a landlord to qualify potential leasers. An insurance company may use to set premiums. Or an employer may use it as a factor for hiring. Even cell phone companies check scores when issuing a phone contract. Since credit can affect many aspects of your life, keeping your credit score as high as possible is vital. It helps to know how to avoid getting lower scores, how to improve one and how to establish one. A credit score is a number between 300 and 850 – and the higher the score, the better. Payment History 35% – Also known as your track record. Do you pay your bills on time? Have you recently missed payments? To improve: Paying bills on time is the best way to maintain or improve your score. Set up online bill pay or automatic payments to ensure this happens. Just one or two late payments can have a detrimental impact. If you’ve missed payments, get caught up and stay current. Recency and frequency count – the longer you pay your bills on time, the better your score. That said, collections, bankruptcies, foreclosures and liens take seven to ten years to clear from credit history and generally cannot be removed any earlier. Amounts owed 30% – This includes all account credit balances as well as your available credit. To improve: To drive up your score, you need to drive down your debt. At the same time, you can’t raise your scores if you don’t use credit. So use your credit cards wisely but pay them off in full each month. If that’s not possible, then keep your card balances below 30% of your available limit and never exceed 50% - even by one dollar. 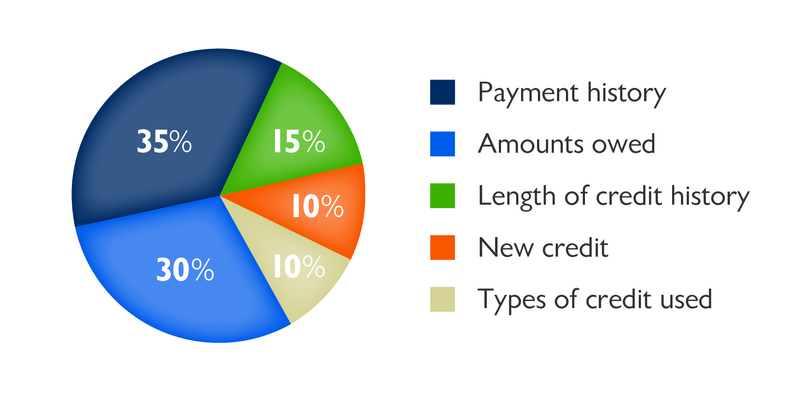 Lengths of credit history 15% – Summarizes how long you’ve had credit. Credit scores favor long histories. To improve: Some experts advocate closing old and inactive accounts as a way of managing credit. But canceling old accounts can lower your credit score by making your history appear shorter. Instead, request to have your available credit levels lowered or close newer accounts. New credit 10% – This includes recent inquiries on both applications and new accounts. To improve: Open new credit accounts only when it’s necessary - not because you can get 20% off your purchase at the mall. If you are currently in need of a loan, limit your loan shopping to a 30 day window to lessen the number of requests for your credit report. This counts as a single loan instead of an attempt to open many new credit lines. It’s ok to request your own credit score; this won’t impact your credit score. Types of Credit Used 10% – Different types of credit – revolving and installment – are better than just credit cards alone. To improve: Don’t open new types of credit just to increase your type of credit accounts, apply for - and open - new credit only as needed. Patrol your credit reports by ordering your copy of a free credit report from AnnualCreditReport.com once a year. Order one report from a different company (Equifax, Experian, and TransUnion) every four months, and correct any errors immediately. When you apply for credit, lenders will often disclose your score at no cost, but if you are denied credit, you are entitled to a copy of your report and credit score. Otherwise, for about $20 you can purchase your credit score online from MyFICO website or any of the three credit reporting agencies. If you don’t have a credit history - here are some steps to establish one but you’ll need a six month credit history and three credit accounts to establish a credit score. Establish financial history: Open a bank account, put utilities in your name and keep them in good standing. While these are not reported to a credit bureau (except DTE), your account history might be considered when applying for credit from that bank. Consider a store or gas card only if it gets reported to a credit bureau: They’re more likely to be approved than general-use cards but, you must be disciplined when using. Make an initial purchase and pay it off in full – as these cards often sport high interest rates. Above all, maintain a good history. Get a bank loan: Use your savings account as collateral. Find a co-signer: For responsible borrowers, this can be a great way to build credit. The key word is responsible. Piggyback: A parent, with good credit scores, can help a child establish credit by simply adding them on to their cards as an authorized user. Parents don’t even have to give the child a card or let them know they are a signer. When all else fails: Open a secure credit card where you pledge money on deposit to secure the credit card.